Edward VI was Henry VIII’s third child, following on from Mary, who was born in 1516 to Catherine of Aragon, and Elizabeth who was born in 1533 to Anne Boleyn. He was Henry VIII’s only legitimate surviving son – Henry and Catherine’s son, Henry, had only lived a few days, Anne Boleyn had miscarried a son and Henry VIII’s only other son, Henry Fitzroy, was the result of an extramarital affair with Elizabeth Blount, one of Catherine of Aragon’s ladies. The young prince was born after a long and difficult labour. Queen Jane went into labour on the 9th October and finally gave birth after two days and three nights on the 12th. Edward was none the worse for traumatic labour and birth, and was perfectly healthy. He was christened on the 15th of October at Hampton Court Palace and his godparents were the Princess Mary, the Duke of Norfolk and the Archbishop of Canterbury. The 4 year old Princess Elizabeth was carried by Edward’s uncle, Edward Seymour the Viscount Beauchamp. Although the Queen seemed to be recovering well from her ordeal at first, she was seriously ill by the 18th . Jane had developed puerperal fever and by the 23rd she was delirious and septicaemia had set in. Jane, the Queen who had given Henry the longed for son and heir, died on the night of the 24th of October. All three of Henry’s children were now motherless. As a baby, Edward was cared for by Lady Margaret Bryan, who had also cared for his half-sisters Mary and Elizabeth, and then Blanche Herbert, Lady Troy. When he reached the age of six, the young prince started his formal education and enjoyed the tutelage of scholars such as John Cheke, Richard Cox, Roger Ascham and Jean Belmain. It seems that he was an intelligent child and by the age of twelve he was undertaking work on religious issues and controversies and had written a treatise about the Pope being the Antichrist. 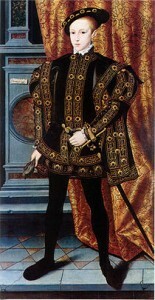 Edward’s father, King Henry VIII, died on 28th January 1547 making Edward King Edward VI of England. However, Henry’s death was not announced to Parliament until 31st January as arrangements needed to be made by Council. Edward was only nine years old and far too young to rule over the country himself so a Council of Regency was set up, according to Henry VIII’s will. Sixteen executors had been named by Henry to act as a regency council until Edward came of age at 18 and this council was led by Edward’s uncle, Edward Seymour, who became Lord Protector of the Realm and who also held the titles of 1st Duke of Somerset and Governor of the King’s Person. It is interesting that Henry VIII’s will never appointed a Lord Protector, rather a council of equals. Other members of the council included Sir Anthony Denny, William Paget, Sir Anthony Browne, William Paulet, Henry FitzAlan the Earl of Arundel and Archbishop Thomas Cranmer. 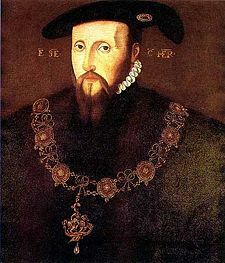 Edward Seymour was not content with just being Lord Protector, by 1547 he had convinced the young King to sign letters patent giving him the right to appoint members of his choosing to the Privy Council and to only consult them when he himself chose to – Edward Seymour was King in all but name. Seymour was a staunch Protestant and so teamed up with Thomas Cranmer, Archbishop of Canterbury, to make the necessary changes to make England a fully Protestant country. Changes and reforms included the introduction of an English Prayer Book (the Book of Common Prayer), the removal or destruction of “icons” or art associated with the Catholic faith (stained glass windows and paintings and a law to allow members of the clergy to marry. However, these radical reforms, anti-Catholic measures and the country’s economic problems led to social unrest in 1548 and 1549, including the Prayer Book Rebellion and Kett’s Rebellion. The rebellions of 1549 were Seymour’s undoing. The social unrest was blamed on Seymour himself and his council rose against him. Seymour was arrested on 11th October 1549 and by February 1550 John Dudley, Earl of Warwick, was heading the Regency Council. Seymour was later executed for plotting to overthrow Dudley. Although John Dudley did not take on the title of Lord Protector, he was the most important political figure in the country and virtually ruled England. He became the Duke of Northumberland in 1551 and ruled the country as Lord President of the Council and Great Steward of the King’s Household. He is credited with undoing the damage of Seymour’s protectorate and helping the country’s economy, although the country’s economy did not significantly improve until the reign of Elizabeth I. Dudley also continued Seymour’s Protestant reforms by confiscating church lands. By the winter of 1552/1553, it was obvious that Edward VI was seriously ill and by May the Council were panicking about the problem of the succession to the throne. Henry VIII had restored his daughters’ succession to the throne, meaning that on Edward’s death the Princess Mary should become Queen, but Dudley and his council had other ideas. Fearing the succession of a Catholic monarch who would undo all of the religious reforms of Edward’s reign, Edward was persuaded to write a document called “My devise for the succession” which made it plain that he wished the protestant Lady Jane Grey, his first cousin once removed, to become Queen. How convenient for John Dudley it was when heir to the throne, Lady Jane Grey, married his son, Guildford Dudley! Everything was set in place to exclude the Princesses Mary and Elizabeth from the succession and for Lady Jane Grey (Henry VIII’s great niece) to inherit the throne. Edward VI’s health steadily declined – his cough and fever became worse, he had difficulty breathing, his legs became swollen and sores or ulcers spread across his ailing body. On 6th July 1553 Edward VI died at Greenwich Palace, aged only 15. The exact cause of his death is unknown, although theories include consumption (tuberculosis) and bronchopneumonia which led to septicaemia and other problems. As planned by John Dudley, Lady Jane Grey became Queen but her nickname “The Nine Days’ Queen” sums up her reign! 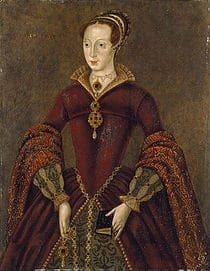 Lady Jane Grey was declared Queen a few days after Edward’s death and was taken to the Tower of London to await her coronation. However, the Princess Mary had learned of Dudley’s plot and she gathered her supporters at Framlingham Castle in Suffolk. Within nine days, Mary had enough supporters to travel to London in victory and stake her claim as rightful Queen. Parliament accepted her claim, she was declared Queen and Lady Jane Grey, Guildford Dudley and John Dudley were thrown into the Tower. 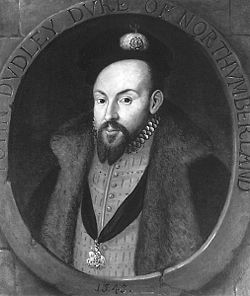 John Dudley was executed for high treason in August 1553 and Lady Jane Grey and her husband were finally executed on the 12th February 1554 after Wyatt’s Rebellion. Bloody Mary should never have been Queen. Edward’s document “My devise for the succession” should have been accepted as his dying rite and Parliament should have rejected her claim since they knew the future damage by letting another Catholic on the throne in a newly formed Protestant society. It was suicide to the society and religious structure! Look what happened to all the innocents that died…She should have been overthrown and assassinated after week 1!